We released a new chapter for our report in April of 2016. We are currently seeking ideas on what should be added as we investigate field-level solutions and write additional chapters. 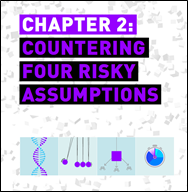 ** NEW CHAPTER (4/2016) ** Based on feedback from our launch last year, chapter 2 tackles “Countering Four Risky Assumptions” (PDF, this chapter only, 1.2mb). Each assumption is sneaky, and seems to aggravate the field fragmentation. Infographic art is from the amazing Raanan Gabriel. 1. 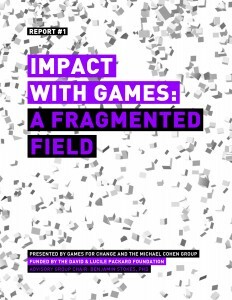 Impact is defined too narrowly: When impact is defined too narrowly, some games are dismissed for the wrong reasons and their impact is overlooked. 2. Key terms are politicized: When stakeholders use core terms (like ‘game’ and ‘assessment’) polemically, productive debate often breaks down as the community becomes polarized. 3. Evaluation methods are inflexible: When researchers have just one gold standard for evaluating games, honest inquiry into complex games is undermined and design becomes more siloed and rigid. 4. Applicants are confused by calls for funding and awards: When organizations advertise a call for proposals, new applicants are often confused about the categories and debate is harmed by a premature (and unintended) sense of consensus. 5. Typologies are deep but not connected: When experts summarize the field they must draw boundaries, but consumers of research need ways to connect various frameworks, literature reviews and typologies. Sound bleak? Stay with us. We are pushing for diagnosis in order to get at solutions (mostly in the next report!). The following organizations have committed to helping spread this conversation in some form, including by hosting conversations around the report, by distributing the report, and/or by providing critical guidance to help refine the report. Of course, they are not responsible for any errors or content in the report itself. Have ideas for this report? Do you lead an organization that wants to help host this conversation? This draft is open for comments! Impact depends on getting the story right, and giving credit to all the intense work that has come before. Please contact us.